Following Google's second I/O keynote, we were ushered into a room where a number of the company's executives were on hand to field questions from the press. Or in other terms, dodge bullets and tell us what we're probably not looking to hear. All jesting aside, the Chrome team was rather forthright during the session, and a number of details surrounding the outfit's (potentially game changing) subscription model were unearthed. Details on contract terms, what's included / not included and where the line is drawn between enterprise and consumer lie just after the break, along with our take on how this monumental announcement may or may not change the way we buy computers. When we initially heard that enterprise users (read: companies) would be able to purchase Chromebooks for $28 per user as part of a monthly subscription scheme, we simultaneously heard the walls shake over at IBM and other solutions providers that charge two arms and part of a leg to provide provisioned machines to employees. Granted, a Chromebook isn't a full-scale Windows or OS X-based machine -- far from it -- but given just how often our work is shifting to the web, Chrome OS is becoming dangerously close to "good enough" for most. Chalk it up to serendipity if you must, but Chrome OS is becoming more and more relevant with each passing day, as we're dealt far fewer offline-only apps and far more cloud-reliant ones. But here's a vital detail that Google glossed over during the frenzy of the keynote: there's a contract attached. This definitely shouldn't strike anyone as a surprise. There's no way Google's shooting out ~$400 machines for $28 per user without a guarantee that end users will be paying the bill for some time to come, and company execs clarified that both enterprise ($28+ / user) and education ($20+ / user) customers will be faced with a three-year contract should they choose to take advantage of the new pricing model. Three years is an awfully long time, particularly when you're dealing with a comparatively low-spec machine such as the ones announced from Acer and Samsung today (both of which will ship June 15th). But for businesses and educational institutions, is it good enough? Probably. It's also worth noting that Google considered shorter contracts (with higher monthly fees), but it found during market research that most institutions never upgraded their machines before three years, anyway. Given that data, it just made sense to offer lower monthly rates and on a refresh cycle that fit nicely with what they found. Let's take a look at the math before diving any deeper. An enterprise user will pay at least $28 to for 36 months, but that includes full warranty and replacement provisions, technical support and all of the updates that Google will provide along the way. Notably, this doesn't include Google Apps -- you'll need to pony up the standard rate for that as an add-on. At a glance, this "bargain" seems like an absurd one, much like subsidized 3G netbooks that faltered quickly after hitting the mainstream just over a year ago. But here's the difference: enterprise and education customers can count on a dramatic decrease in costs from a maintenance standpoint. It's difficult to place a proper value on those aspects, but there's no question that entities will spend less time -- and in turn, less money -- applying patches, installing updates, cleaning out old files, and managing a daunting fleet of machines that are used abused day in and day out. With Chrome OS, a user would simply login at the start of one class, and log out at the end. Clean, simple, hassle-free. But that's just the start. Enterprise and education users will receive access to a management console (to administrate their machines), a direct tech support line to folks at Google and a Google-backed warranty. In contrast, a consumer user will have to phone up the laptop manufacturer and rely on its warranty. It may be difficult for the average consumer to wrap their noodle around that proposition, but trust us -- that in and of itself will likely be worth the long-term price increase to institutions. Additionally, there is no need to purchase licenses for anti-virus, data encryption or data back-up software, all of which are huge thorns in the side of businesses. Let's look at it another way: if you ran a school with thousands of students, would you rather pay $400 up-front per student for a machine that you'd need to continually maintain and troubleshoot, or pay around 2.5x as much over the course of three years for one that includes a direct help line? Amortizing costs goes a long way in a place where budgets matter. Thanks to an Enterprise session here at I/O, we were able to learn quite a few details surrounding the dollars and cents of it all. For starters, enterprise and education users will need to purchase a minimum of ten Chromebooks to take advantage of the subscription rates. That should cover the vast majority of those interested in such a thing -- if you and your brother need two for your small business, you're currently out of luck. But we're guessing those fringe cases will be just that -- fringe. Education customers will get $20 per user pricing with a three-year contract, while enterprise and business customers will pay $28 to $30 (Update: Google has since clarified that the Samsung model will cost $2 more) per user for the same period. We're told that purchasers can select the WiFi version of the Samsung Series 5 or the Acer Chromebook at that rate -- if you need 3G-enabled models with 100MB of gratis Verizon Wireless data throw in, that'll run you an extra $3 or so (an estimate provided to us here at I/O). As for overseas buyers? European carriers will hash out details in Spain, France, UK, Netherlands, Germany and Italy, but nothing's being revealed today. We're told that Google's still evaluating what makes the most sense in those nations. Consumers, of course, will pay a flat rate, and will be looking to Acer or Samsung for warranty work and technical support. The Series 5 gets going at $429 for the WiFi model, while the 3G edition (which does indeed include 100MB of data from Verizon each month for the life of the product) will go for $499. Acer's Chromebook will cost $349 for the WiFi model, while the 3G variant will demand an undisclosed amount more. If you're curious about any early termination fees, kudos for thinking proactively. Unfortunately, the news isn't good. In effect, there is no way to sneak out of your Chromebook contract early. According to Google, users who wish to terminate must "pay out the rest of their contract." In other words, you're paying for a 36 month lease -- the only question is whether or not you want Google's support or not along the way. Granted, we can't say we expected the company to be lenient in this area with so much on the line, but we'd probably recommend a solo Chromebook buy first to make absolutely sure this new OS suits your business needs. 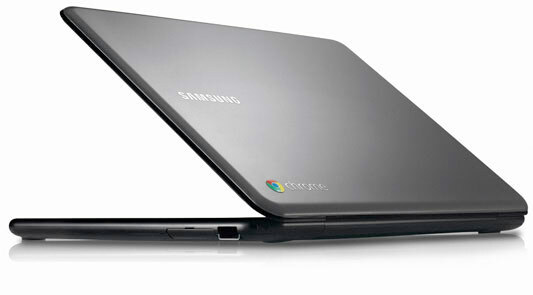 Does Chrome OS have the chops? 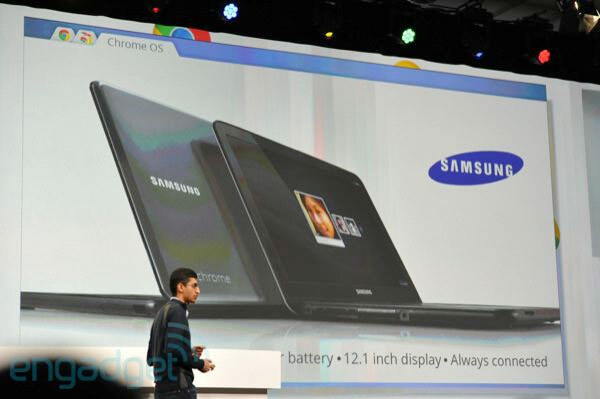 You've heard it before, and you'll hear it again: Chrome OS isn't "a real operating system." There's no question that it's different; it's the first major OS to launch without the ability to install local, desktop-based applications. Particularly for businesses, this could be a major deal-breaker. To solve that issue, Google has partnered with Citrix to create a new build of Citrix Receiver, a piece of software that should leave its existing beta trials and hit the public universe this summer. We saw a brief demo of the software used on a CR-48, and while the setup was obviously optimized, it worked shockingly well. A backend Windows server had a copy of Photoshop CS5 onboard, and the CR-48 was able to load it within a matter of seconds through Receiver. Not a light model -- we're talking about the full, bona fide version of Photoshop. Of course, you'll still need to manage a backend server in a scenario like this, but given that most businesses and schools already have something similar in place, it shouldn't be asking too much to pipe things in via Receiver. Unfortunately, mum's the word on price, and heaven only knows what kind of lag you'd see when applying filters to a 5MB image over 3G, but at least the possibilities are there. 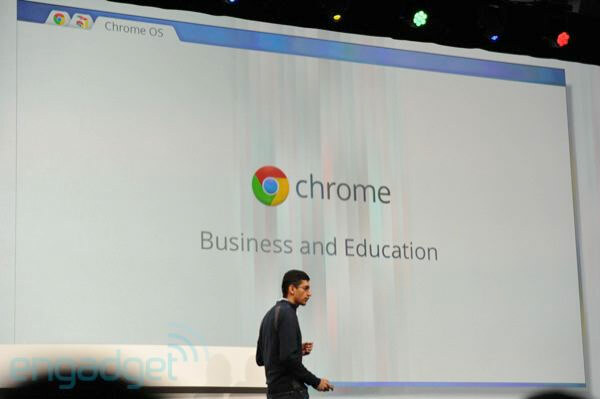 Even Google confessed that Chromebooks won't work for everyone, and definitely not for every business. But the dead-simple management aspect should have a lot of CIOs turning their heads, particularly with this new wave of hardware. The CR-48 was never a speed demon, but Samsung and Acer's new offerings should be more than capable of handling Google Spreadsheets and the occasional slide deck. Our take? This new wave of hardware -- particularly when you consider the faraway Chromebox -- finally puts Chrome OS in a position to thrive, and the new pricing model finally makes it accessible to scaling businesses. As Google rightly pointed out, you can lease computers now from pretty much any OEM in the industry, but you're on your own when it comes to software management. Or, of course, you can pony up well over $30 per user to hand that off, too. Are subscriptions the future for Chrome OS? I'll close with this. I had my doubts about Chrome OS' ability to truly grab hold in a market that isn't exactly prepared to rely solely on the cloud, but with Google's new efforts to enable offline support for vital applications -- as well as Citrix Receiver for times when desktop apps are needed -- my view is changing. It's sort of funny to think that Chrome OS may gain its traction within the enterprise first, but for companies desperate for simplicity in the IT room, today's pricing model instantly makes a ton of sense. Beyond that, $349 for Acer's highly portable 11.6-inch Chromebook creates a tantalizing offer for everyday consumers -- folks like you and I. Netbook-level hardware has never handled Windows 7 with grace, and Google's gone out of its way to break Chrome OS down to a point where it runs swimmingly on low-cost hardware. The company's selling Chrome OS as a software + hardware combo; OEMs who are interested in shipping Chrome OS machines will have to abide by Google's stipulations, but it creates a better overall user experience, I can't find a good reason to kvetch. I'm pretty well sold on the software aspect, but it's up to hardware manufacturers to really polish things off. Something tells me I'll learn a lot more on that end when Samsung's own event kicks off here in just a few hours.